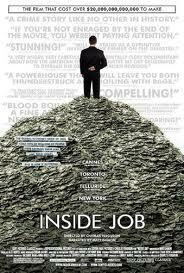 Finally got to see the Academy Award-winning documentary "Inside Job." True to advance billing, it made my blood boil. Clear, concise, instructive in the best sense of that word, "Inside Job" lays out the hidden dimensions of America's true criminal class -- Wall Street banksters. Actually, not all that hidden, since every president since Ronald Reagan has participated in the public unleashing of the rapacious egos who have not once but repeatedly brought us widespread ruin ... for everyone but themselves. Every president. That includes Bill Clinton. It certainly now includes Barack Obama. Because, as someone says on camera in the movie, we now have a government by, for, and of Wall Street. Charles Ferguson, the producer/writer/director of "Inside Job," famously said as he accepted the Academy Award on February 27, "Forgive me, I must start by pointing out that three years after our horrific financial crisis caused by financial fraud, not a single financial executive has gone to jail, and that's wrong." The biggest revelation for me was the extent that academic economists -- particularly at prestigious schools like Harvard, Columbia, Princeton -- were and are corrupted by Wall Street money. The economists that get swooned over and quoted widely on TV talk shows and hired into every president's inner circle are essentially whores for money. They'll agree with whatever fraudulent scheme the big bucks want to sell. You should watch this movie. You should educate yourself. The banksters are betting you won't. The coup is almost complete. I'm not surprised there's only response to this post. The "most limited" responders who try to dominate this site are totally ignorant of the film and the truth of our national crisis and totally believe the Fox and Limbaugh explanation of our national economic problems. Sorry.....meant to say "only ONE response." Or it could be because we agree with the post (and the film) and see no reason to spend time dittoing it. It's all insider politics--bankers, Ivy League lawyers, and establishment politicians of both parties. It's fine to talk about Art Pope and the Koch's, but remember that Mr. Hopey-Changey was the #1 recipient of Wall Street money. Or shall we talk about how GoldmanSachs helped write the Democrats post-2008 financial regulation? I'm totally okay with everything JW said in this post. All I'd ask is that the liberal readers of this blog take note that it isn't government versus Wall Street, it's government supporting, protecting, and caressing Wall Street. Big Finance needs Big Government to survive. That's one reason why we Teahadists don't like Big Government. I can only hope that films like this will get your head out of the clouds and show you that the beautiful dreams you have for government inevitably end up perverted by well-connected special interest groups like Wall Street. The only difference is that Dems and Reps have different special interest groups. Meh. Hey, Teahdist. By "government" you mean "privately owned government by the corporatists" right? Because the Teahadist Governor of Michigan just got through a bill that will allow him to declare an "emergency" and replace all locally elected officials with his own man to run things. Is that what you mean by small government? Brotherdoc, Does this quote from your post mean there is a limit on how much education one should have ? "over-educated men" I personally strive to become more educated every day. At what point will I cross the line to having too much knowledge in your opinion ?